Information on our anemometers, windvanes and other products is available by clicking the links on the left. For answers to common questions regarding things like instrument connections, wiring, cable-colours, calibration and installation click HERE. TECHNICAL SUPPORT: If you have a technical enquiry, and cannot find the information/answers you need on this website, then technical support is available via email at sales@windspeed.co.uk - we generally cannot answer technical questions over the telephone. If you must telephone with a technical query, you will need to leave an email address where we can contact you with an answer. 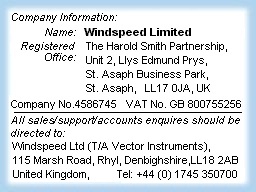 Copies of Manuals (Operating Instructions) and calibration data for specific instruments are normally available on request by contacting Technical Support via our sales@windspeed.co.uk email address. Please note: Our sales office is based in the UK and phone calls can only be answered during normal UK working hours (9-5 UK time, monday-friday, excluding public holidays). At other times, please leave a voicemail message, or send your enquiry by email (or using the form below). If in Central Europe, try calling during your usual office hours. If you are having trouble contacting us by phone or fax, please let us know using the form below so we can investigate any possible problems. Note: We ask that you enter a valid email address so that we can send you an answer to your enquiry. Unfortunately, our website is sometimes unable to send email to the email address entered due to technical problems (or your ISP or email server rejects emails sent from our website for some reason). If this is the case, we will be unable to accept your enquiry via this form/webpage. If this happens, please accept our apologies and contact us directly by sending an email to us using your normal email program specifying the information you require (or phone/fax our sales office if you prefer). Our email address, phone/fax numbers and address are shown at the bottom of this page. (Please ensure that you specify your NAME, COMPANY and COUNTRY. via this form (nor via ordinary email) as it is not secure. Please use the phone or fax (see numbers above) to convey any such information. Page Rendered in: 0.289951 seconds. - Powered by Mambo.